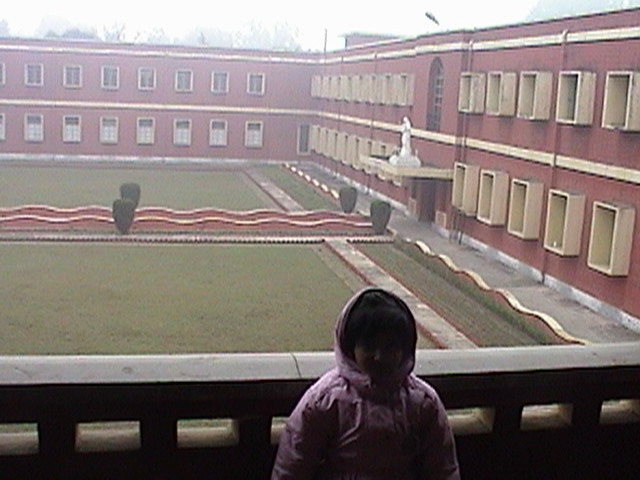 The school building and the lawns from the corridor outside what used to be the library. 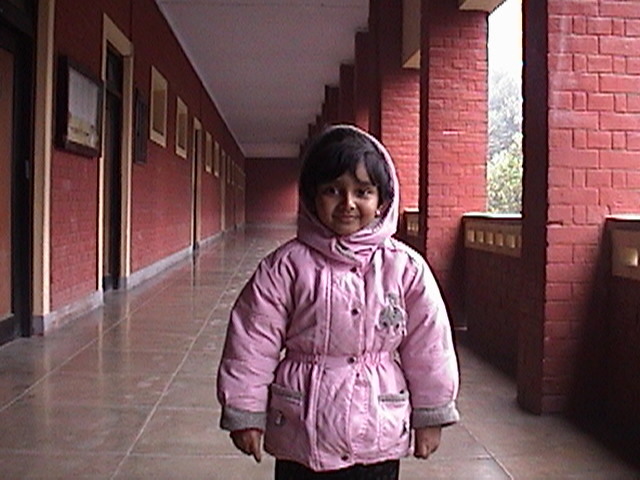 Arpita standing in the ever so familiar corridors leading to the classrooms that housed the 5th and 7th grades in 1980-83. Mrs. Bhatnagar took me over to meet the principal, Reverend Brother Paul. Sitting in one of the chairs in the Principal's Office, I was reminded of an incident from when I was still a student in 1988. I believe we were testing the boundaries at the time, when equality with grown-ups was concerned, and I guess, the same feeling got the better of me and I sat without invitation or asking in this same office. Our principal at the time, our beloved Brother Aloysius, who usually did not object to us sitting next to him at sporting events objected. "Get up, my son. You can't sit there," said Aloo, as we called him. "Why?" I retorted. "We sit with you all the time at the games." Looking back, I feel ashamed of my impudence, which was indeed the arrogance of a 16-year-old, and the infinite patience that Brother Aloysius had. He smiled, as he always did, and said, "You can sit there when you come to see me with your chhotu (child), son." I did not think about that until I was back in the principal's office with Arpita. He was right after all. The first time I got to sit in that same chair was with my chhotu. While I am disappointed that Brother Aloysius is no longer with us so that I could share this thought with him, I am sure he was looking down at us and that he will bless Arpita the way he blessed us all with his presence in our lives at one time. 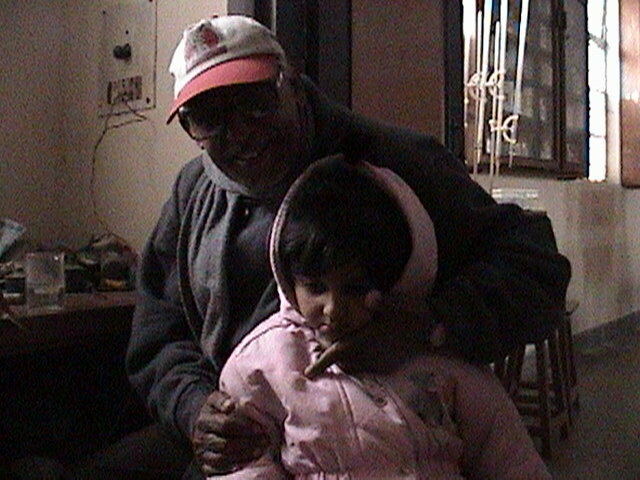 Arpita, with Mr. N. S. Yadav in the Chemistry Lab. All said and done, I returned with copies of the Marian Lookout's special Golden Jubilee edition (incidentally, our school celebrated its Silver Jubilee when we were in the first grade in 1977), key rings and commemorative school caps for Krishnan, Lakshmi and myself. I also picked up a Shastri House T-shirt for Krishnan and two Gandhi House T-shirts for Lakshmi and myself from the official school tailor in Sadar Bazaar, with the hope that we can wear those the next time we are together. Mrs. Trivedi was kind enough to provide me phone numbers for my first teacher, Mrs. Ahuja, now retired and living in Gurgaon, and our fifth grade teacher, then Miss Kushwaha and now Mrs. Sinha, who now lives in New Delhi. I talked to Mrs. Ahuja on the telephone but could not reach Mrs. Sinha, something that I will leave for my next visit in and around my school. 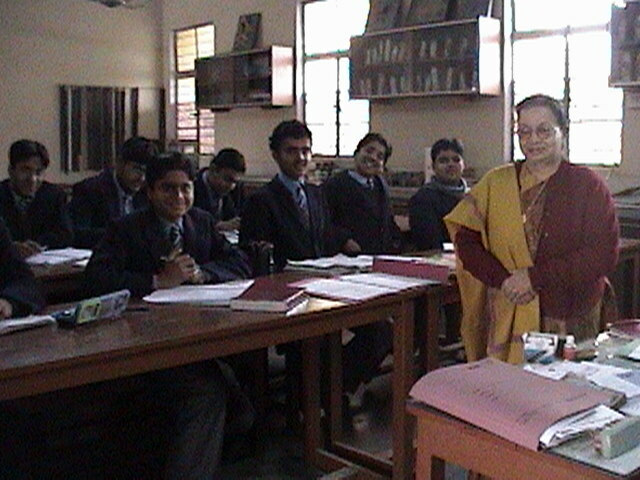 Evergreen Mrs. Bhatnagar and her Biology Class - a few things never change, thank goodness!! !